Energetic, Discovery-Based Learning Michael Serras Discovering Geometry will energize your geometry classroom, involving your students and making them active participants in their own learning. Students discover and explore geometric relationships using a wide variety of tools, from compasses and straightedges to computers and graphing calculators. Students learn theorems and definitions by performing constructions, measuring figures, relating patterns and properties, and discussing their findings. 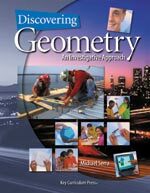 Carefully constructed investigations guide students to write and utilize their own definitions and formulate their own geometric conjectures. Motivating and Lively Curriculum Filled with appealing graphics and lively writing, Discovering Geometry draws students in and the real-world applications, puzzles, and extensions keep them involved and thinking. In addition, the books focus on critical problem-solving skills helps students become self-motivated, independent thinkers. Teachers using Discovering Geometry see their classrooms transformed into exciting forums filled with enthusiastic problem solvers. The Teaching Resources Package provides comprehensive support to enrich learning and to make your teaching experience more rewarding.